Add your own school of fish to your decorating theme. Stencil Fish Schools on toss pillows and bring the beach inside. It's easy to stencil this design on toss pillows, and change or refresh the look of your home. Our unique Paint-A-Pillow stenciling kit has everything you need to complete this contemporary design. You customize your pillow by choosing your color and adding embellishments, such as tassels, studs or rhinestones. No stenciling experience? It doesn't matter. 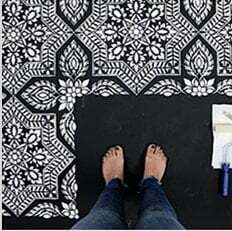 Stenciling is an easy art to learn and you get great results even if you are a newbie. Be part of the DIY craze and make something you can be proud of. Host a Paint-A-Pillow party and invite friends and family to let their creativity flow. Even children love to stencil and enjoy making pillows for their rooms. With a Paint-A-Pillow kit your color choices are not limited - you can pick any colors you want and even mix your own custom hues.